A crash doesn't appear to be the cause of this latest Tesla fire. While driving down the road, this Model S became engulfed in flames. The driver was alerted by other motorists and pulled over to quickly exit the vehicle unharmed. Tesla says it is already investigating the incident. The cause is unknown at this time, though the flames do appear to be coming from the front section of the battery pack. Additionally, video of the Model S on fire was posted. You can check out that footage below. 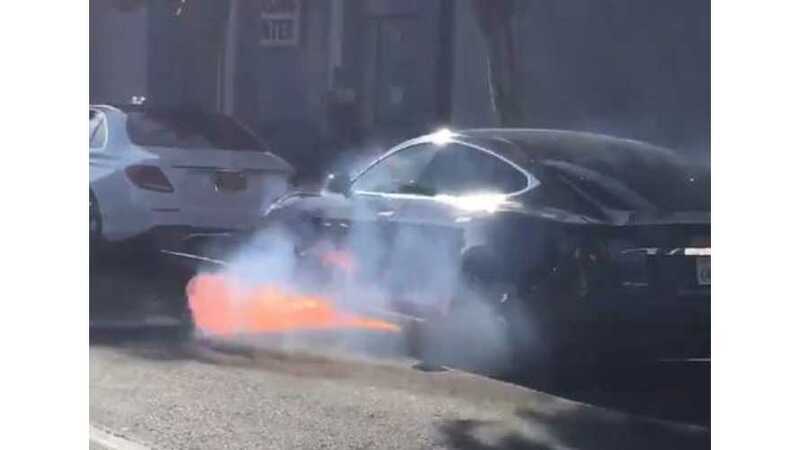 Historically, electric car fires are rare, though it does seem Teslas are more prone to this than other electric cars. Part of this may lie in the cell chemistry, which is considered more volatile than what most other automakers employ. The upside is that Tesla batteries are the most energy dense in the electric car segment. This is a developing story. Stay tuned for additional updates.